Amazon has added a Washington insider to its board of directors. Jamie S. Gorelick was elected to the board Thursday, according to a filing with the U.S. Security and Exchange Commission (SEC). Gorelick, currently a partner with the law firm Wilmer Cutler Pickering Hale and Dorr, was formerly the number two official in the U.S. Justice Department from 1994 to 1997 and vice chair of Fannie Mae from 1998 to 2003. During her tenure at the Justice Department she is known for a 1995 memo nicknamed "Gorelick's Wall," which set guidelines for the separation of intelligence between law enforcement and the military. That policy was later cited by the Bush Administration as "the single greatest structural cause for September 11," a charge Gorelick refutes. As part of her appointment to the board, Gorelick was awarded 3600 shares of Amazon stock -- worth about $665,000 at today's stock prices -- which she'll receive over a three-year period. In light of the recent Washington versus technology war over the Stop Online Privacy Act (SOPA), the appointment of Gorelick is an interesting one. 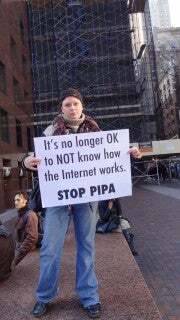 The online outpouring of outrage that felled SOPA was unprecedented. Mobilizing that kind of opposition against every bill that could be hurtful to the Internet or mustering support for measures helpful to it is impossible. For most Washington battles, you have to play the inside game, and to play that game, you need insiders, like Gorelick. That's something that Amazon appears to be recognizing.